With the BBQ season almost upon us, now is the time to invest in those perfect summer essentials. Let’s take a moment to forward in time and imagine a Saturday afternoon. The sky is blue and the sun is beaming. You’re at home in the back garden with a bunch of your closest friends or family. The kids are splashing around in their blow-up paddling pool and the tunes are blasting through the kitchen window. The Barbie (Australian slang for BBQ, I believe) is smoking and grilling all your favourite foods. The amazing crisp BBQ smell is filling the air. Inside you’ve laid out all the nibbles, burger baps, condiments and salads on the table. You’ve really put on a lovely spread for your loved ones. As the afternoon ends and the evening draws closer, the kids are in bed and so out comes the wine. The wine you store in a gorgeous wine cooler. Your multi temperature wine cooler. You’ve got white wine for Sally, a perfect cool red for Paul and a cheeky bottle of chilled Prosecco for you and Sarah. Bottles, temperatures and flavours to suit all your guests. Smiles and laughter as you clink glasses in a cheer to life and good health. Just picture it. Your perfect summers day. Your perfect best of British BBQ. You need that wine cooler, right? I mean it adds the ultimate perfect touch to your party hosting, right? Yeah… I need one now too. This visualisation has literally got me so excited for the summer. I can almost taste the BBQ food and of course the vino too. Now we’ve set the scene, let’s get into it. You don’t have to be a wine expert to fully appreciate a beautifully designed wine cooler. Nor do you have to be a massive wine drinker to have one either. Some models have shelves that enable you to store beer and lager too. We have a fantastic range of wine coolers by top brands, in varying sizes, colours and zones to suit any home. A few of our current top sellers consist of the Caple WI3121 30cm under counter wine cooler (perfect for if your space is limited), the CDA FWC303SS 30cm freestanding slim line under counter wine cooler (perfect if you have a narrow space), Fisher & Paykel RF356RDWX1 60cm freestanding dual zone wine cooler (perfect if you like to drink both red and white wine) and Liebherr WKB4212 60cm Vinothek wine cooler (perfect for storing your favourite wine). All models are made to satisfy all your wine needs. Those of you who may be a bit of a wine connoisseur will know that red and white wines need to be stored at different temperatures. Let’s get wine specific. Red wines should be served at a warmer temperature than white wines because they contain more tannin (polyphenol). At higher temperatures, tannin reacts more swiftly to oxygen. This process is referred to as: the wine breathing. A desirable effect – for only once the wine is saturated with oxygen, does it unfold its full aroma and flavours. It’s all very fancy, isn’t it? Bottles of champagne and Prosecco taste better after they have been chilled, making the bubbles taste crisp, so even if you don’t drink great amounts of wine, there is nothing to say you can’t buy a wine cooler and fill it up with champagne. Personally, that would so be my thing! Wine coolers come in either single or multi temperature zones so you can choose which suits your wine drinking more. For example, if you like both red and white wine, maybe even rose too – a multi temperature zone wine cooler would be a better fit for your needs. This way you can store all wines at their optimum storage temperatures for the perfect drinking. Multi temperature wine coolers come in a choice of sizes and you can either buy under counter or upright. If, however you only drink white wine or prosecco for example, then consider a single temperature zone wine cooler as these are better suited for only storing one type of wine. Single zone wine coolers come in a larger variety of sizes and come as either under counter or upright. Most wine coolers are available in either stainless-steel or black glass and look incredibly stylish with their LED lighting and visible shelves. Some models can either be single doors or double doors too – there really is a choice for everyone and every home. 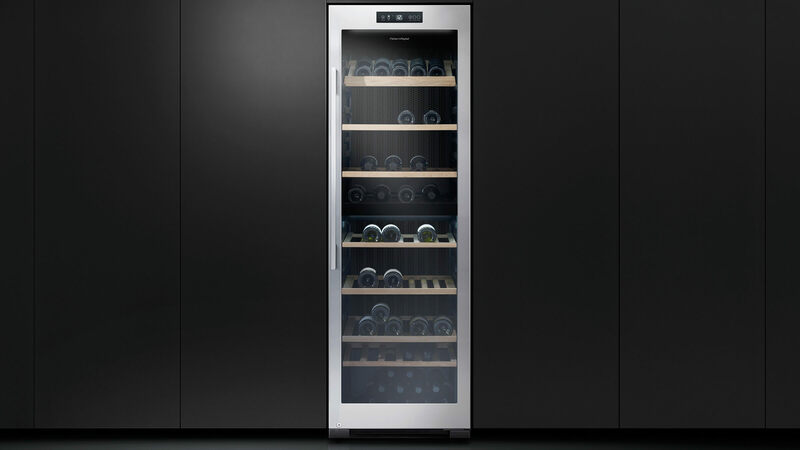 We have a wide range of both integrated and freestanding wine coolers from top selling brands such as Caple, Liebherr, Miele, Bosch, CDA and Fisher&Paykel simply to name a few. So, being as I mentioned a few of our top sellers, I best explain what makes them our top sellers. Caple WI3121 30cm under counter. 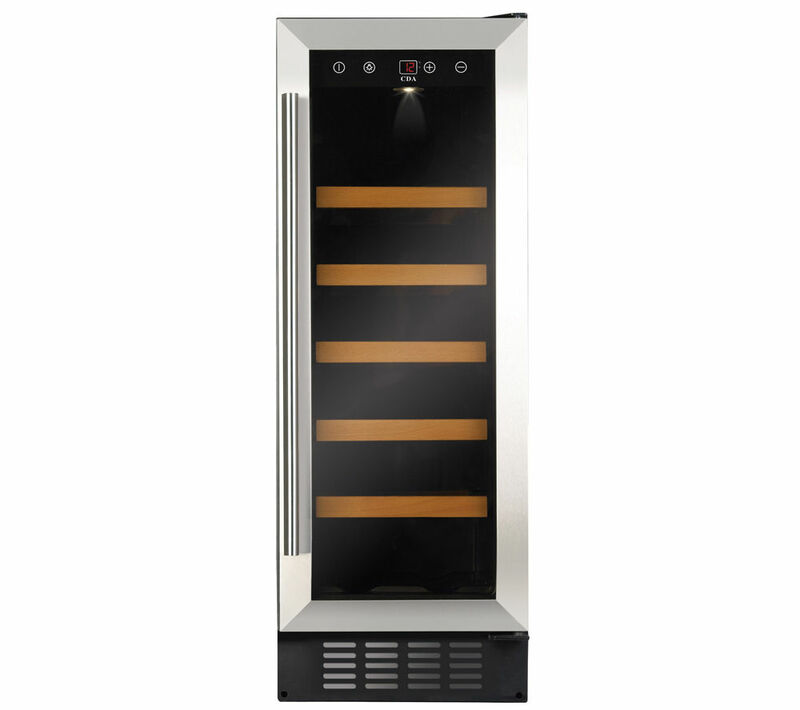 This stunning wine cooler from Caple is currently our best seller, it comes with a stainless-steel door and is a single temperature cooler. So, this type of wine cooler would be great if you only drink one type of wine. The temperature range is between 5°C-18°C so allows you to set it according to which wine you want to store. It has a no-frost compressor cooling technology which enables the cooler to maintain a consistent temperature. This model converts into a can chiller using the optional glass shelving, so you can store cans of pop, beer or lager if wine doesn’t tickle your fancy. CDA FWC303SS 30cm freestanding slim line under counter. This small slim line wine cooler by CDA can hold up to 20 bottles of wine. This model has a single temperature storage zone so again perfect for if you only drink one type of wine. 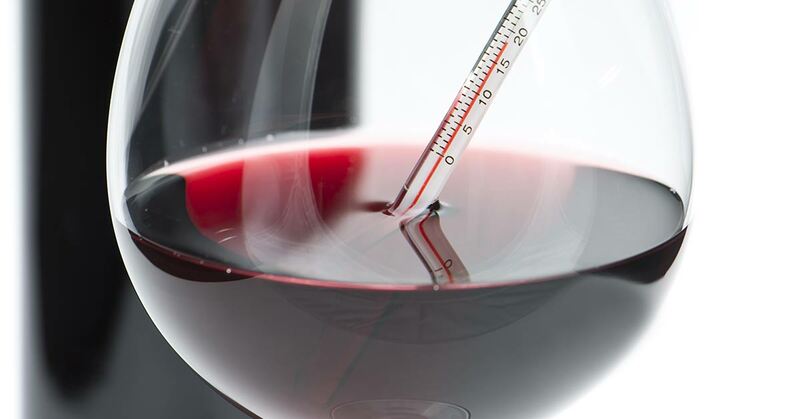 The temperature range is between 5°C-22°C so allows you to set it according to which wine you want to store. It has a double-glazed door and is available in either black glass or stainless steel. 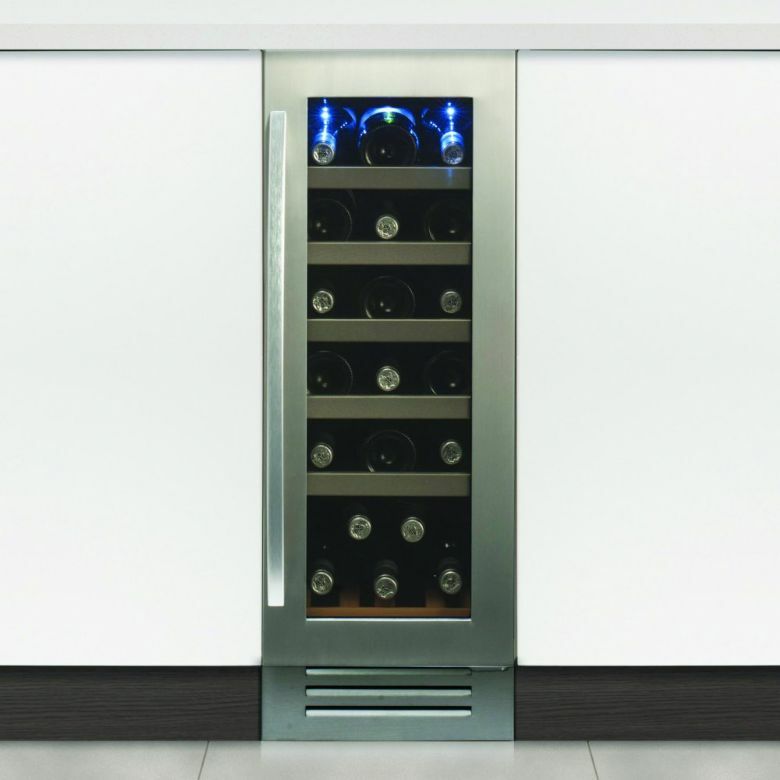 Due to its small and narrow size, this wine cooler can be placed anywhere in your kitchen. It adds a touch of style to any room. Fisher & Paykel RF356RDWX1 60cm freestanding dual zone. This stylish stainless-steel wine cooler from Fisher&Paykel can hold an impressive 144 bottles of wine. Because of its dual zone, you can store both red and white wines at their individual optimum storage temperatures. The temperature range is between 5°C-20°C so you can set your storage temperatures to suit your preferences. With beautiful oak shelves inside this wine cooler is a nice focal piece for any kitchen. 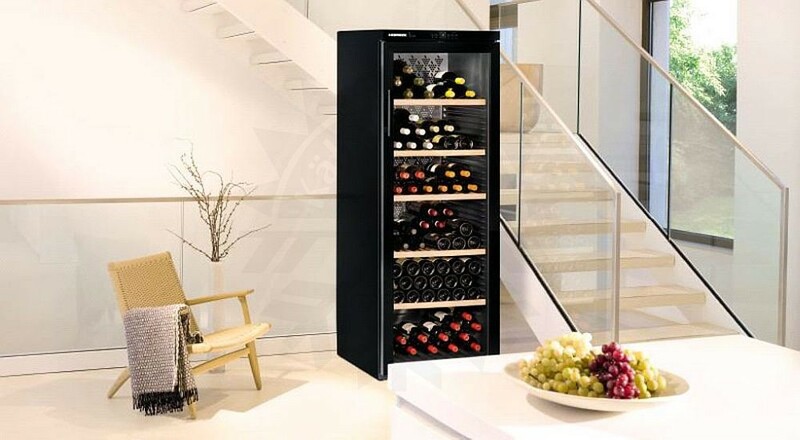 This stunning Liebherr single temperature zone wine cooler has the capacity to hold an impressive 200 bottles of wine. Finished in black this wine cooler is designed to store one type of wine in and has an even consistent temperature throughout. The temperature range is between 5°C-20°C so you can set your storage temperatures to suit your preferences. A wine cooler of this size will require a space within your kitchen however because it is a nice appliance, it’ll make a lovely focal point in the kitchen or dining room. Something to really show off to your friends about. Let’s go back to visualising. So, you were in the back garden, right? 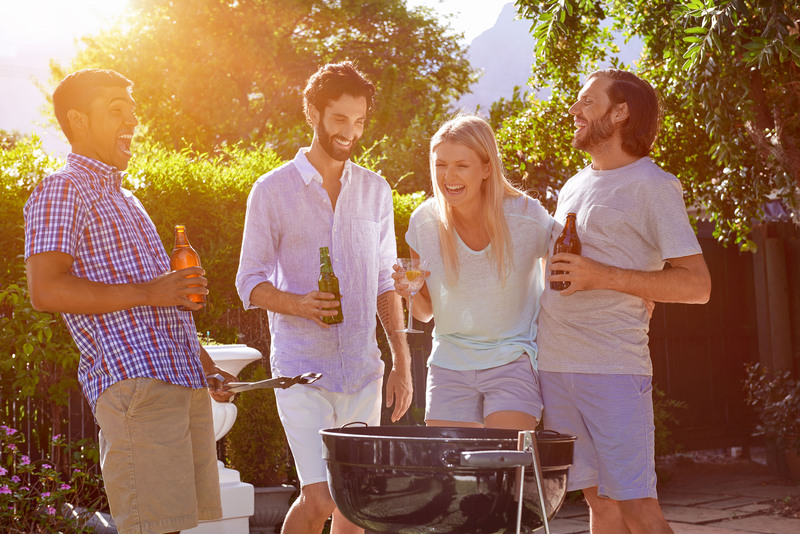 Sipping on your favourite wine, surrounded by gorgeous BBQ food and hanging with friends. They keep complimenting how good the wine tastes at its perfect drinking temperature. They keep commenting on how stylish your wine cooler is and how much they need to get one too. Imagine that. Don’t be without your perfect wine cooler this summer. Whether its single or dual zone, 30cm or 60 cm, integrated or freestanding, be sure to purchase your perfect match in time for the summer months. We have some amazing deals on wine coolers, by top selling brands. I hear you say, what if we don’t have a summer? Well who cares, we need a wine cooler no matter what time of the year it is. It’s party time all the time, right?